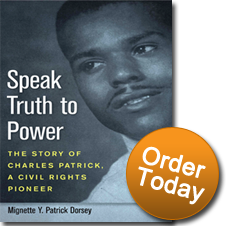 A half-inch indentation in his chin reminds Charles Patrick of the cost of courage. At 91, he can still recall the day an argument with a white woman over a parking space in downtown Birmingham, Alabama led to a 1954 beating that nearly killed him. Yet there is no bitterness, no malice, no desire for vengeance. His brave stand whereby he publicly accused the white police officers elicited a rare unity among black and white citizens, politicians, and the press. The officers were ultimately fired, the charges against Patrick, dropped. Patrick realizes he is only one of many unsung African-Americans who resisted oppressive powers prior to the start of the civil rights movement. The difference is that his story was widely publicized ... and he has lived to tell it fifty-six years later. Copyright 2010 Mignette Patrick Dorsey. All rights reserved.